Is there a cure for anorexia? The first goal of anorexia treatment is to restore a normal, healthy body weight. Some people elect for outpatient anorexia treatment. However, if the person seeking treatment is dangerously underweight, they may need to first enter a hospital. Anorexia recovery centers often combine psychotherapy with medical treatment and nutritional support. Professionals will structure rehab differently for each individual. In therapy, patients can address other mental health issues that may be contributing to their anorexia, such as depression and anxiety. Dietitians and other healthcare providers at anorexia rehab centers will help patients change their old habits and beliefs about food and dieting. They will help the patient develop a healthy relationship with exercise, often reducing the amount of daily activity. The person with anorexia needs to participate fully in her own therapy. Many people with anorexia do not realize that they have a problem, so convincing them to participate can be difficult. People with anorexia usually maintain a distorted view of their body, and they may not realize how dangerously thin they have become. A summary of anorexia treatment studies says that 47% of people recover completely and 34% of people improve. However, relapse is common, and 21% of patients develop a chronic eating disorder. People with anorexia often delay treatment until their condition gets very serious or even life-threatening. Ifa person’s life is in danger, she may need to seek treatment in the hospital. In the hospital, emergency room doctors will monitor vital signs and treat issues such as heart rhythm disturbance, dehydration, electrolyte imbalances, or psychiatric emergencies. 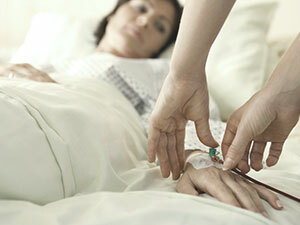 Hospitalization may be necessary if malnutrition is causing medical complications. If a patient continues to refuse to eat in treatment, they may also require hospitalization. In severe situations, a patient might require feeding through a tube that goes into their stomach through their nose. Residential inpatient rehab centers are an alternative to full hospitalization. Patients live at the facility and get around-the-clock treatment from eating disorder specialists. Many people find that an intensive inpatient program is the best way to start the recovery process. People at residential anorexia recovery programs benefit from a comprehensive rehabilitation program with a multifaceted approach. They will receive medical care from physicians who specialize in treating eating disorders. Physicians will help patients find medications that can improve their mental health. People will also receive individual therapy from trained professionals and will meet other people suffering from anorexia in group therapy sessions. After patients start to gain weight and are no longer at risk of severe malnutrition or suicide, they typically transfer to an outpatient program to continue their therapy. Assessing suicide risk is a critical component of anorexia treatment, especially for people with other psychiatric illnesses. People with anorexia are at an extremely high risk of suicide. Half of all anorexia-related deaths are from suicide.2 A residential rehab program provides a safe space for an evaluation of suicidal ideation. If you need help finding a residential anorexia treatment program, or if you’re looking for another type of recovery program, call our confidential helpline at . Outpatient anorexia recovery centers also provide specialized care for eating disorders. The treatment center might offer daily or weekly therapy sessions either on an individual or group level. In treatment, people may also work with a dietitian or nutritionist to develop a healthy eating schedule. The person in treatment continues to live at home instead of living at the rehab center. Working with a psychotherapist the person trusts will go a long way toward maintaining healthy eating habits. Individual therapy can help the person develop a positive body image and change the feelings and behaviors that led to anorexia. Individual therapy programs also teach people how to deal with stressful life situations and how to avoid relapsing. Luxury and executive facilities are residential treatment centers that offer extra amenities for those in treatment, including accommodations for working professionals. These treatment centers are sometimes found in peaceful environments such as horse ranches, beach houses, or even converted old mansions. They offer residential quarters that resemble nice hotel rooms, and they may offer work stations for professionals to work remotely or to manage flexible work schedules. Luxury anorexia recovery programs offer all the conventional medical and psychological treatments, such as individual, group, and family therapy. But they frequently will also provide alternative treatments such as massage, mindfulness, meditation, yoga, acupuncture, and biofeedback. Anorexia rehab involves several different types of therapy. Nutritional counseling: Dietitians teach patients about healthy eating and nutritional planning to help them modify maladaptive eating behaviors. Alternative therapies: Alternative medicine complements more conventional treatment, helping reduce patients’ anxiety levels. Activities such as yoga, massage, acupuncture, and meditation can promote relaxation and well-being. Call to get more information about anorexia treatment centers and therapies. Support groups are often a part of the multifaceted approach to anorexia recovery. In these groups, people in anorexia recovery and their families can share their stories with one another. It can be comforting to hear others speak about their struggles, which may be similar to yours. Your local community center or church might offer eating disorder support groups. Twelve-step programs are also available for eating disorders. Eating Disorders Anonymous uses the same 12-step approach as Alcoholics Anonymous. People go to these free meetings to support each other’s recovery. Newcomers find a veteran of the program to “sponsor” or personally support them. This person is usually in long-term recovery from anorexia. Online groups are available if you can’t find an Eating Disorders Anonymous group near you. Check out their website for information about online, phone, and Skype meetings. Eating Disorders Anonymous: EDA is a 12-step peer support treatment program. Peer-to-peer groups: People with eating disorders and their families organize these community groups. Outpatient group therapy: A professional moderates these groups. They usually meet at hospitals and anorexia treatment centers. Anorexia is extremely dangerous. If you see signs of anorexia in yourself or someone you know, get help right away. Our knowledgeable treatment support staff can help you find a treatment program that will work for you. Call our helpline today at to speak with someone about your options.
. Lock, J., & Fitzpatrick, K. K. (2009). Anorexia nervosa. BMJ Clinical Evidence, 2009, 1011.
. University of Maryland Medical Center. (2015). Anorexia nervosa. Complementary and Alternative Medicine Guide.
. The Mayo Clinic. (2016). Anorexia nervosa. Patient Care and Health Information.
. Lock, J., & La Via, M. C. (2015). Practice parameter for the assessment and treatment of children and adolescents with eating disorders. Journal of the American Academy of Child & Adolescent Psychiatry, 54(5), 412-425.
. National Institutes of Health. (2016). Anorexia.